Lots of SKUs? 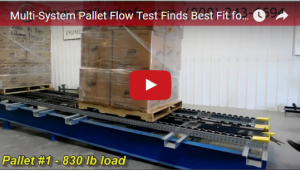 Do You Choose Pallet Flow… or Pallet Flow? Large to small, heavy to lightweight, fast mover to steady… sometimes there’s little in-common when it comes to inventory specs from one SKU to another but that doesn’t stop pallet flow from providing several good options for efficient storage and distribution for the whole group. Recently we developed two pallet flow tests to help a customer that manufactures household and commercial cleaning products. They supplied us with 5 GMA-style wooden pallets in pretty good condition and each with a different configuration of plastic wrapped boxed inventory from 4’ to 6’ tall and weighing from 335-830 lbs. They needed a solution that would work across inventory segments so our Engineering Testing Lab team got to work. 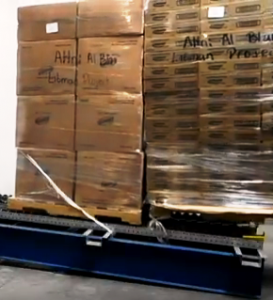 The push-back lane in Test 1 offered a deep-lane solution and opportunity to increase the number of pick faces in the same square footage vs traditional pallet flow due to using a single aisle for loading and unloading. The Test 2 lane was the same rail configuration with the addition of drop-in speed controllers to control the flow and tracking of the tall product down lane. In addition, a pallet separator was added to the test to offer the option for picking directly from pallet if the customer chose for certain SKUs. The pallet separator holds back the rear pallets so the front pallet can be safely emptied and removed before the rear pallet advance to the pick face. The only caution our engineers noted with either system tested was about the plastic wrap around the boxes… but we always caution our customers to check for loose shrink wrap when loading pallet flow systems because it can get lodged in the rails and interrupt the flow process… and we certainly don’t want that. Ultimately this customer chose push-back pallet flow to be able to accommodate the largest variety of SKUs as well as to handle the different pallet types that they use in their inventory. We were happy to have been able to give them options to choose from in order to make the best selection for their warehousing needs. What inventory challenges are you trying to overcome? Can we test a few options for you to help you make the best choice for your business? Just give us a call and we’ll get started right away.